You can’t help it. Your eyes light up at the sight of it and your taste buds start tingling, and it’s all because of that incredible piece of beef with more marbling than a Greek bathroom. But what’s it all about and what does it mean for that piece of steak you’re about to eat? Marbling is the visible unsaturated (healthy) intramuscular fat that accumulates within the muscle and between the muscle fibre bundles. Visually, marbling is soft intramuscular (between the muscle fibre) fat made up of polyunsaturated, monounsaturated and saturated fats. At chiller temperatures, marbled fat appears white and will become less obvious as the meat comes up to room temperature with unsaturated fats beginning to melt. Marbling is determined by both genetics and nutrition. 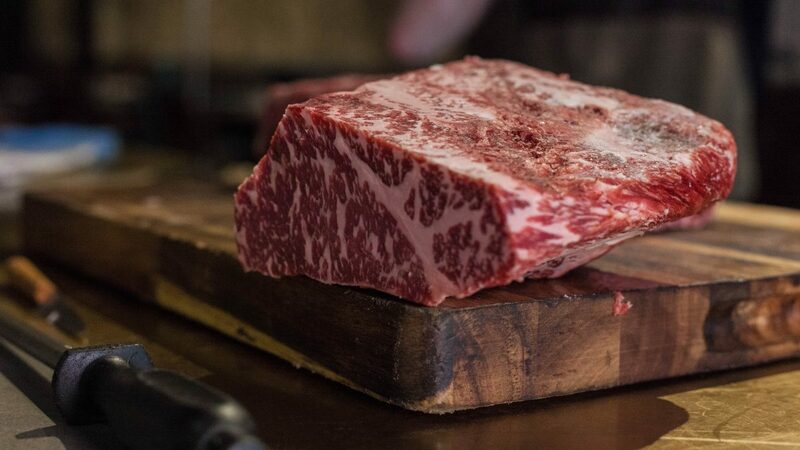 Generally, Wagyu will develop considerably more marbling than other breeds. Most are feedlot fed on carefully designed rations of straw for roughage, and grain for protein and carbohydrates. What does it do to the beef? The presence of marbling has an extremely positive effect on the eating quality of beef, in terms of tenderness, juiciness/moisture and flavour. The fat makes the meat softer and easier to chew, as there is simply less muscle fibre and collagen per unit volume of meat. This decreases the amount of chewing required, leading to a more rapid breakdown of the food, and greater flavour release. A small study also found that when specifically Wagyu and Angus steaks had more than 10 per cent intramuscular fat, the steak had significantly higher Flavour Volatiles – a measure of the taste intensity. How does it change the flavour? What’s that old anecdote? No fat, no flavour. With a higher fat content, perceived sweetness will increase, a higher oily mouth-coating will become more obvious, and the sour/acidity or acidic aftertaste and lingering aftertaste decreases. When eating meat with a higher marble score, a more noticeable amount of meat juice (liquid fat and saliva) is produced, compared when eating lower marble score grade meats. With a more rapid breakdown of the food, we experience a greater flavour release, and are more likely to get a higher peak flavour concentration. What are the different grades of marbling? In the Australian meat industry the marble score grading is between, 0 to 9. 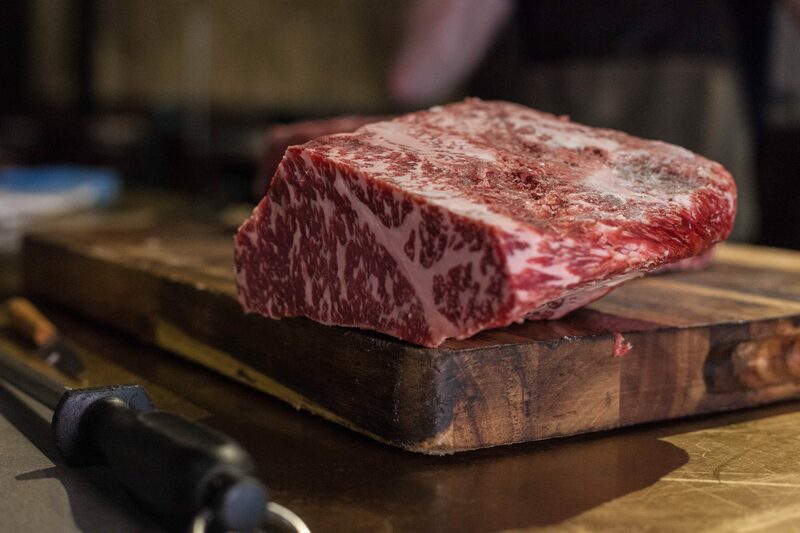 Marble score or grades are a component of the AUS-MEAT beef quality grading system, and is assessed within the ribeye muscle. In addition to the quantity of marbling, the distribution and texture of visible fat flecks within the ribeye are also considered during assessment of marbling score. How do you cook it at home without ruining it? Always remove the meat from the refrigerator 20-30 minutes prior to cooking. If meat is too cold, cooking time – and importantly – flavour and tenderness will be negatively affected. Season meat with salt either directly before cooking, or for optimal results 40 minutes prior to cooking. Salting ahead of cooking draws out the moisture from the meat, dissolves the salt and with sufficient time (i.e. 40 minutes), the moisture reabsorbs back into the meat, leading to well-seasoned, tender and moist meat when cooked. Be sure to allow enough time for the reabsorption to happen, otherwise the moisture sitting at the surface will evaporate once the meat hits the pan, resulting in a dry and tough meat. Use a frying pan! Barbecues and chargrills are often left to get too hot and will cause the marbled fat to flame and melt away, resulting in a dry and charcoaled, burnt steak. Instead, cook in a non-stick pan over medium heat with only the smallest amount of oil in the pan, if any. Place the steak in the pan, seasoned side down. The marbled fat will baste the meat from inside as it slowly melts, resulting in a great flavour. When you begin to see only small spots of moisture appear on the uncooked side of the steak, turn it, and only once. Don’t wait for copious amounts of blood to appear on the raw surface, as you are only boiling all of the moisture out of the meat. This will lead to a dryer, chewier and harder to swallow piece of meat. To finish, briefly increase the heat and sear to achieve a golden, caramelisation. Remove from pan and let the meat rest for half the time it was cooked for, uncovered. This allows the moisture to be re-absorbed and distributed more evenly within the steak. While waiting for the steak to rest, finish plating the rest of your meal components. Then serve when ready. With the findings of a completed study compiled by the CSIRO, it will be welcome news to marbled meat eaters. Previous CSIRO research has found that Western consumers tend to avoid fat in meat because of health concerns. Australian adults are currently advised to eat lean, unprocessed meat and trim off excess fat to reduce their intake of saturated fat, whereas the visible marbling, unsaturated (healthy) intramuscular fat (IMF) is not as bad as we have always been led to believe.